Blindness’ story revolves around an epidemic of blindness that spreads quickly bringing society to a state of chaos. 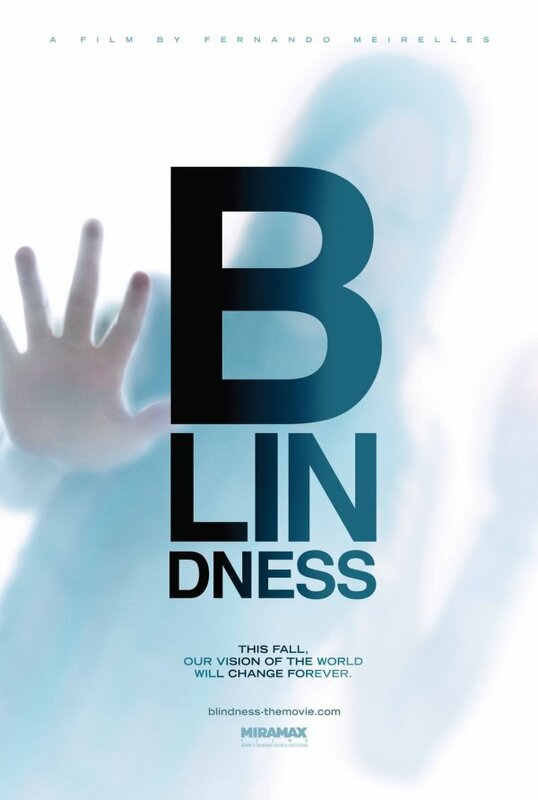 This first teaser poster for the movie focuses squarely on the sight loss aspect, giving little attention to the epidemic/chaos angle. We have the letters for the title arranged in a form reminiscent of an eye chart. Behind them a milky white surface that obscures what seems to be a person. This is obviously intended to represent the onset of the white blindness and gives the poster the point of view of one of the people affected by the epidemic. I’m not sure the arrangement of the letters isn’t a little too cute for this film, but I think the overall image works. It’s strong, memorable, a little disturbing and representative of the movie’s story. Or at least of one side of it. Blindness is an interesting marketing challenge. The premise certainly is intriguing and it would be easy to market this as a typical apocalyptic horror/thriller or as disturbing but entertaining suspense filled struggle for survival, especially if you focus on the Julianne Moore character, who can still see. Think Dawn of the Dead, War of the Worlds or Shyamalan’s upcoming The Happening. But if the film is anything like the book that wouldn’t really get at the humanity and the themes that are at the core of story. It also might be a bit misleading. But highlighting the aspects that made the book unique would be much harder, and even if the effort is successful it might alienate the broader audience that could make the film a bigger hit. The first poster could be for a horror movie, but it isn’t obviously so. And it is subtle enough to give space for the rest of the marketing materials to take the campaign one way or another. It will be interesting to see what, if any, other posters are created for the movie and what the final trailer will look like. This is just Day of the Triffids without the plants! Cheeky sods. is this movie an adaptation from book by Jose Saramago ? nice poster btw, from what i read inthe book (if it is an adaptation) the mass blind phenomenon makes people look only white….not black as ussual…it’s cool! !